North Dakota health professionals recognize World Autism Awareness Day. In 2018, the CDC determined that approximately 1 in 59 children is diagnosed with an autism spectrum disorder. Autism is a disorder that can stretch over a wide spectrum. Boys are four times more likely to be diagnosed with autism than girls. 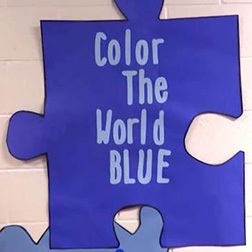 Autism Speaks report that 1 in 37 boys and 1 in 151 girls are diagnosed. CHI St. Alexius Health staff focusing their efforts on providing education and resources. "We have people that are diagnosed with autism that are very successful and very independent people that can function completely normal in their lives. They may have some challenges that they may face, they have some adaptations that they need to make to their daily lives. But they are still people and they can still be a big part of our society," said Kristy Lang, Occupational Therapist. According to Autism Speaks, there's no one cause of autism. Research suggests that autism develops from a combination of genetic and no genetic, or environmental, influences.